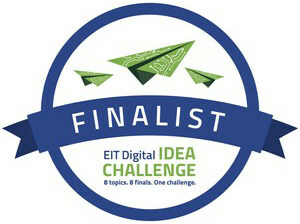 Overall, we were 461 startups from 26 different countries to submit to the EIT Digital contest. In our category, Cyber Physical Systems , there were only 9 startups selected as finalists. December 4th, during the final we will explain how the emergence of 2 new technologies helped us to transform the in-store sales paradigm and propose this interactive demonstrator, highly relevant to our retail customers and their in-store visitors. We will share our vision, developments, and how the EIT Digital program will support us. EIT ICT Labs Idea Challenge is a europan Innovation challenge to detect and support the best digital startup in Europe with a high growth potential.